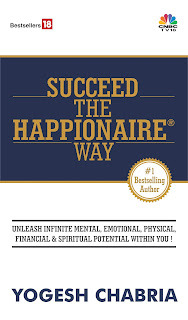 Yogesh Chabria - The Happionaire ​Blog - Best Motivational Speakers In India - Inspiration, Success: Can I Really Cash The Crash? Can I Really Cash The Crash? I was speaking to someone who entered the realty space a few years ago. He has invested over Rs. 700 crores into developing a township in Southern India. A large part of the funding has been done by banks and financial institutions. Now while the project started, he was expecting revenues of over Rs. 2500 crores from the entire project. He had assumed he could sell each square foot for Rs. 5,000. I remember telling him more than a year ago, how real estate prices are overvalued and will fall and how it would be best for him to reduce prices and sell. That time he was making a decent profit and could have easily sold his stock for Rs. 2,500 a square foot. This means he would have still got back Rs. 1250 crores on an investment of Rs. 700 crores. This was good money but he didn’t exit that time. Today he is unable to sell even at Rs. 2,500 a square foot and is not only stuck with huge inventory, but also has to repay banks and financial institutions. Buyers will not buy property even at Rs. 2,500 a square foot, because they feel it will go down even further. Even if interest rates go down, and the government announces stimulus packages people will not buy if they feel they can get a abetter deal by waiting. I have suggested to him to sell now, even if he just recovers the cost, because if he waits any longer there could be a lot more stock coming in from several builders and he might not even be able to recover his cost. I see a lot of builders going bust and this could mean even more trouble for someone like him. Instead if he exits now, he will have a lot of cash which can be used to buy cheap assets. He will also not have to pay interest on the loans he has taken. Today land prices have already fallen from their peaks and if he has cash, he can buy this land for the future. I know of so many people, who are willing to sell several acres of land in prime areas across the country at a flat 50% discount to what they were asking a year ago. He can actually make cash out of this crash, if he takes his cash of the table and uses it to buy things even cheaper. No crisis lasts forever and anyone who sees a longer term picture can Cash The Crash! A Crash is the best time to create wealth and I am not just saying it for the sake of saying it, but based on personal experience. The sad part is that, most people discover opportunities they could have benefited from only after the crash and crisis is over. For instance how many people actually went out and bought property after the real estate crash of 1996 – 1997? They were available almost 70% cheaper. I wrote Happionaire’s™ Cash the Crash so that I could share the knowledge needed to first understand then benefit from the crash. I have shared the tools needed to analyze financial statements such as Balance Sheets and P&L, while analysing one of my personal investments which is already rewarding me quite well and is available at least 400% cheaper than it’s true value. In a Crash so many things are extremely mouth watering and delicious! I have even shared quite a few secrets about investing and business, which most “Insider” investors, hedge funds and people responsible for the crash wouldn’t want you to know. Happionaire’s CTC doesn’t just look at stocks, but the entire world of investing, business and more. At the end of the day everything is related. And of course I don’t need to say, that everything has been written keeping the Happionaire philosophy in mind - that is to make sure everything is fun, simple and interesting. To spread the message of financial literacy and empowerment, we need to speak the language most people understand. By the grace of God, the people who have read the book, have already given me extremely positive and heart warming feedback. It is really nice to know that words have so much power. They can make someone smile, feel nice, learn more and even benefit financially. Words influence the way we think, and the way we think decides what we do with our lives. Sometimes great opportunities come disguised as problems and challenges. Let positive thoughts, words and people surround you. Don’t listen to people who are constantly grumbling and cribbing about problems, instead look and learn from people who have gone on to create tremendous wealth. The stock plunge "doesn't make any difference," says Warren Buffett, one of the richest Happionaires on the planet. "It's happened to me three other times," he says. "It happened when it went from 90 to 40 back in 1974, and it happened in 1987. It went down 50 per cent in 1998-to-2000. I mean, I hope I live long enough so it happens a couple more times." Keep smiling, learning and believing in yourself and you can certainly Cash the Crash! Those Who Cashed The Crash In October - Are They Really Kings? Do You Think You Can CashThe Crash Too? Share Your Views With Other Happionaires! I did not know that real estate devleopers were in such big trouble. The media has not yet revelaed such details. Even though I hope your friend gets out of trouble a part of me feels they charged too much and are to blame for their greed. But I also feel sad for them and their workers. I am someone who definetly beliievs in the idea of Cash The Crash! Am eagerly waiting to get my copy and learn more Yogesh! Please get it out fast...and let us know when we can get our copy! Am a big fan of you and WB! I can already see myself waiting in a line to make sure I grab the first copy of Happionaire's CTC as soon as it hits bookstores. Loved ITHW and I'm sure am going to love this one too. I delayed the purchase of my apartment thanks to ITHW and am like quite a few others who ended up saving several lakhs. Of course I started investing with Rs. 5,000, and have made minor loss of Rs. 2000 on that. But no problem ...luckily i followed your suggestions and didn't put in lots of money at one go. When is it going to be out Yogesh? Please get it out fast, so we can benefit and learn. Since I read ITHW, I couldn't even find one book that could explain balance sheet and P&L. Really want to learn it! Yogesh Bhai, its good to know that the progress on your latest book is so quick. I am sure that all those people who have ITHW, would love to grab this book as well. I agree with Sunil. I am sure all of us would love this book. And I Sunil, I have a feeling that this one will certainly be at an intermediate level, i.e. start where ITHW left. Thing like analysis of Balance Sheet are really tools I am eagerly looking forward too. I loved ITHW and even made my 11 year old son read it. You won't believe it, but even he loved it and since than has become more careful with money. In fact he now wants to sell his old comics and start some fun business. Hahaha....it is very sweet. I had a suggestion, I'm sure CTC will do well - I will make sure all my friends buy it too, but Yogesh, why don't you come out with some stories/books/games which will help more families and children learn about money? I see so many parents spending money without any sense for their children and spoiling them. There is a major need to educate children on money and I feel you do have the gift of being able to touch the lives of our country's children. Happy New Year and hope to see much more from the Happionaire way this year! You know, I was just thinking about doing something so I can benefit from all the meltdown and as luck had it I read your post. The timing is perfect for such a book. Very very very very eager to read how to Cash The Crash. Aarti...what a coincidence even my 14 year old son loved reading it and in the holidays told me how he wanted to come to work with me so he could learn.......Happionaire's Cash The Crash am eagerly waiting for it. I am 65 years old and after reading Invest The Happionaire Way, I really felt very nice because I had learnt so many new things. I even gave it to my son and grandaughter. I liked the suggestion given that the Happionaire message is very important for families also. Our families all need to learn more about finance and money. Very good one Aarti. All of us who loved ITHW will surely love CTC - am sure! Keep creating the smiles Happionaires. The Happionaire Way is surely moving ahead fast! :-) And am sure millions of more people will be touched by it. Just one suggestion - please continue keeping the same book format and I really liked the simple design and format. It makes it more easy and fun to read. I am waiting to cash the crash fast!!!! Anyone know when the copy of Cash the Crash will be available? Yogesh, for when is it planned? There are lots of ways one can earn money online, one way of doing that is by the way of seminars. The great thing about attending or giving seminars is that you get to interact with many people and those could well become your affiliates. Bookmarked this. Thank you after sharing. Definitely worth my time. This is a superior article as they all are. I from been wondering nearly this looking for some culture now. Its notable to receive this info. You are objective and balanced.